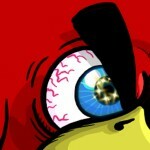 Here is our walkthrough strategy for Angry Birds Seasons Invasion of the Egg Snatchers Level 2-29. The score in the video below is 192,240. You can read more about the Invasion of the Egg Snatchers update and find helpful links here. Similar to the video, but with better damage for 204790. I agree with @dmsral..I was sitting at 186210 with a pig sitting and 2 more on the deck. That would of worked out to 211210 if that pig had continued rolling.Lots of points available with persistence. Played like the video for current high score of 228920. Same as video and @pellystar, good destruction after bird 2 because of the two rockets on the right, but alos sent quickly Red bird on remaining debris for more points. Same as video and @pellystar, good destruction after bird 2 because of the two rockets on the right, but also sent quickly Red bird on remaining debris for more points. Thanks @happy66 I hope this one sticks: at one point on this episode I think I had 4 highscores and one by one the sheriff came to town, leaving just the one now! 195,570 – shooting same as video. @Hunnybunny am i still allowed to give a little Whine? I don’t see that i ever did in this level..
Sooo Why not here goes..